Portrait of Mozart wearing the Order of the Golden Spur, received in 1770 from Pope Clement XIV in Rome. The painting is a 1777 copy of a work now lost. 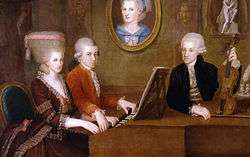 ↑ Sources vary in how Mozart's name should be pronounced in English. Fradkin (1996), a guide for radio announcers, strongly recommends [ts] for letter z, but otherwise considers English-like pronunciation fully acceptable; thus /ˈwʊlfɡæŋ æməˈdeɪəs ˈmoʊtsɑːrt/. 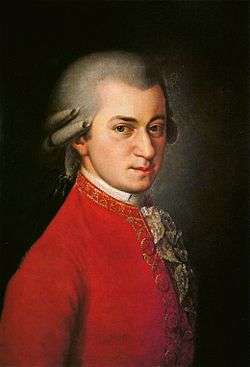 ↑ Mozart's exact name involved many complications; for details see Mozart's name. ↑ Source: Wilson (1999, 2). The many changes of European political borders since Mozart's time make it difficult to assign him an unambiguous nationality; for discussion see Mozart's nationality. ↑ "Andante in C major, K.1a (Mozart, Wolfgang Amadeus)". IMSLP. imslp.org. 21 April 2014. Retrieved 20 December 2014. ↑ "Allegro in C major, K.1b (Mozart, Wolfgang Amadeus)". IMSLP. imslp.org. 23 May 2012. Retrieved 20 December 2014. ↑ "Allegro in F major, K.1c (Mozart, Wolfgang Amadeus)". IMSLP. imslp.org. 15 January 2014. Retrieved 20 December 2014. 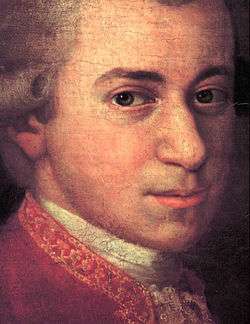 ↑ "MOZART, Wolfgang Amadeus (1756-1791)". english-heritage.org.uk. Retrieved 23 October 2016. ↑ Meerdter, Joe (2009). "Mozart Biography". midiworld.com. Retrieved 20 December 2014. ↑ Gutman (2000:271). For details of the story, see Miserere (Allegri) and Mozart's compositional method. ↑ For new information on this episode, see Ilias Chrissochoidis, "London Mozartiana: Wolfgang's disputed age & early performances of Allegri's Miserere", The Musical Times, vol. 151, no. 1911 (Summer 2010), 83–89. ↑ Halliwell 1998, p. 225. 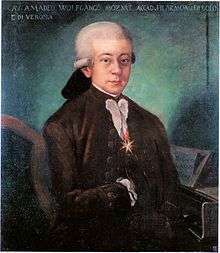 Archbishop Colloredo responded to the request by dismissing both Mozart and his father, though the dismissal of the latter was not actually carried out. ↑ Piotr Napierała. "BAROQUE COMPOSERS (Piotr Napierała)". 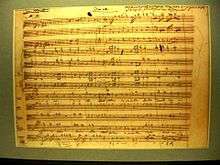 baroquecomposers.blogspot.nl. Retrieved 29 January 2015. ↑ He wrote during that period that, whenever he or someone else played one of his compositions, it was as if the table and the chairs were the only listeners. Histoire de la musique occidentale, Jean & Brigitte Massin, ed., Fayard, Paris, 1983, p. 613. ↑ Mozart complains of this in a letter to his father, dated 24 March 1781; see Spaethling (2000:235). 1 2 Translation by Spaethling (2000:237); the letter dates from 24 March 1781. ↑ Barry 2000. 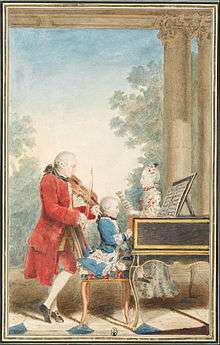 For detailed discussion of the influence of Opus 33 on the "Haydn" quartets. ↑ Mozart & Mozart 1966, p. 1331. 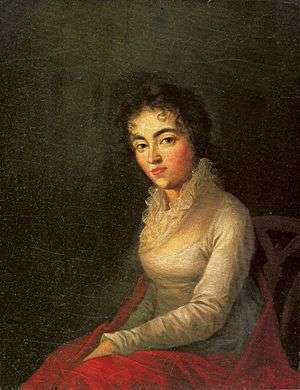 Leopold's letter to his daughter Nannerl, 14–16 May 1785. ↑ Rushton, Julian. Mozart: An Extraordinary Life, p. 67 (Associated Board of the Royal School of Music, 2005). ↑ Palmer, Willard. W. A. Mozart: An Introduction to His Keyboard Works, p. 4 (Alfred Music Publishing 2006). ↑ Solomon 1995, pp. 423–424. 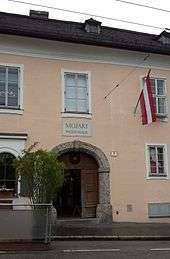 A more recent view, Wolff (2012), is that Mozart's position was a more substantial one than is traditionally maintained, and that some of Mozart's chamber music from this time was written as part of his imperial duties. ↑ Solomon 1995, §30. More recently, Wolff (2012) has forcefully advocated a view of Mozart's career at the end of his life as being on the rise, interrupted by his sudden death. ↑ Crawford, Franklin (14 February 2000). "Foul play ruled out in death of Wolfgang Amadeus Mozart". EurekAlert!. American Association for the Advancement of Science. Retrieved 26 April 2014. ↑ Becker, Sander (20 August 2009). "Voorlopig is Mozart bezweken aan streptokok" ("For the time being Mozart succumbed to streptococcus"). Trouw. Retrieved 25 April 2014 (Dutch). ↑ Bakalar, Nicholas (17 August 2009). "What Really Killed Mozart? Maybe Strep. ".The New York Times. Retrieved 24 April 2014. ↑ See , and critical comment with reply at . ↑ Goldstein, Jack (2013). 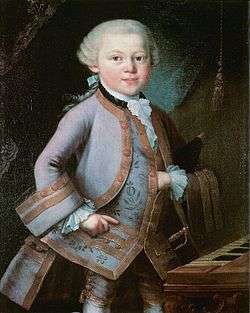 101 Amazing Mozart Facts. Andrews UK LImited. ↑ Abert, Hermann (2007). W.A. Mozart. Yale University Press. p. 743. ISBN 0300072236. Retrieved 20 May 2014. ↑ Solomon 1995, ch. 8. Discussion of the sources of style as well as his early imitative ability. (German) Haberl, Dieter (2006). "Beethovens erste Reise nach Wien: die Datierung seiner Schülerreise zu W. A. Mozart". Neues Musikwissenschaftliches Jahrbuch (14). OCLC 634798176. March, Ivan; Greenfield, Edward; Layton, Robert (2005). Czajkowski, Paul, ed. Penguin Guide to Compact Discs And DVDs, 2005–2006 (30th ed.). London: Penguin. ISBN 0-14-102262-0. OCLC 416204627. "Award of the Papal Equestrian Order of the "Golden Spur" to Wolfgang Amadeus Mozart". Vatican Secret Archives. 4 July 1770. Retrieved 27 September 2010.